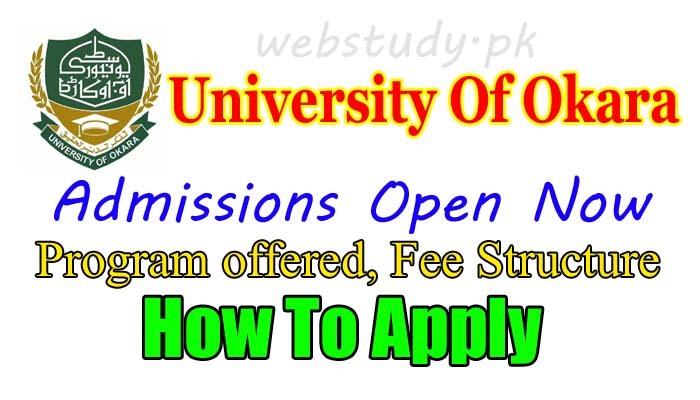 University Of Okara admission 2019 are now open for all the undergraduate, Post graduate, Mphil and PhD programs so all the students who were waiting to open the admission in okara university admission 2019 can apply. Every year thousands of students apply for admission but only lucky ones get admission who scored most in intermediate or previous section. University Of Okara is providing quality education to students under comfortable environment ths is why institute is making its place in best universities list by HEC. University Of Okara admission are open for all the department and courses like BS, BBA, B.ED, MA, M.ED, B.ED Hons, BS Mathematics and chemistry. Students can apply for admission in both sessions (morning and evening). University Of Okara was established in 2005 and this is campus of university of education. Infact it is university of education but campus in okara so it is called university of okara. Every year thousands of students got certificates and degree signed by chancellor. Since university have only few departments and offeres few programs but now they are offering BS mathematics since 2012 and M.phil program from 2011. Along with that University Of Okara is also offering MA education, Biological Science, BBA hons, BS hons, chemistry, maths etc, B.Ed and B.ED hons is also included in courses. University of education okara campus (UO) admission advertisement was published in newspapers in which all the details were mentioned that where to collect the admission form and where to submit the application form and what documents are required for UO Admission 2019. University of okara provide all the basic facilities to the students like airy rooms, play grounds, library, labs, canteen, transportation and hostel facility. All the students enjoy their time they spend at university of okara UO. First apply onine for admissions in Okara university or you can download complete prospectus from university website along with admission form. Print out the admission form and fill with great care because false information will lead you to cancel the admission at any stage. Submit the form before due date to the related department along with bank challan. Challan form can be downloaded from university website. Student have to submit the separate fee for each program and shift. Your application forms should reach the deparment within the due date, late coming forms will not be entertained. Attach two attested photocopies of relevant documents. Attach three recent passport size photographs. Separate Applications should be submitted against reserve seats. Duly filled forms should be submitted to the concerned departments. Morning and Evening forms should be submitted in proper file covers (Morning white file, Evening brown file) separately. Attach original bank receipt of Rs: 250/- with each form. The fee can be deposited in any HBL branch. Webstudy.pk is providing you with all the information Okara university UO admission 2019 and also providing you with important dates for your admission like last date of form submittion, entry test date, entry test result date, merit lists display date, last date to submit dues. As all the other universities offers scholarships to the needy and derserving students as UO is also giving the scholarships to the students on need base. University of okara scholarships 2019 will be given to students by PEEF. This scholarship is available for all the needy master level students. For more details of this PEEF scholarships for master level students visit finanace offce room number 140 in campus. All the eligible candidate will get their scholarships. Last date to submit form to get scholarships is October 2019. Special Quota Category students will get special fee discount.